AMC 8 is next Tue. I picked 7 problems from the 2007 test. Try to do them in 1 sitting and see how long it takes you to finish. Nov 12: students were surveyed about their pasta preferences. The choices were lasagna, manicotti, ravioli and spaghetti. The results of the survey are displayed in the bar graph. 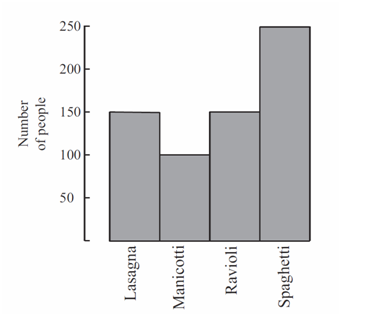 What is the ratio of the number of students who preferred spaghetti to the number of students who preferred manicotti? Nov 13: The average cost of a long-distance call in the USA in was cents per minute, and the average cost of a long-distance call in the USA in was cents per minute. Find the approximate percent decrease in the cost per minute of a long- distance call. Nov 14: For any positive integer , define to be the sum of the positive factors of . For example, . Find . 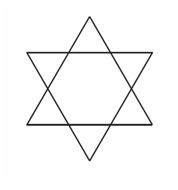 Nov 15: A unit hexagram is composed of a regular hexagon of side length and its equilateral triangular extensions, as shown in the diagram. What is the ratio of the area of the extensions to the area of the original hexagon? Nov 16: Let and be numbers with . Which of the following is impossible? has thousands digit and units digit . What is the sum of and ? Nov 18: Two cards are dealt from a deck of four red cards labeled and four green cards labeled . A winning pair is two of the same color or two of the same letter. What is the probability of drawing a winning pair? AMC 8 is coming up soon. One difficult topic that we haven’t touched this year is probability, and so we’ll practice a few this week. There is also an easy topic, problems related to time and dates. We’ll also practice a few this week. Nov 5: A three-digit integer contains one of each of the digits , , and . What is the probability that the integer is divisible by ? Answer: B. Digit 5 has 1/3 of chance to be the unit digit. Nov 6: Abe holds 1 green and 1 red jelly bean in his hand. Bea holds 1 green, 1 yellow, and 2 red jelly beans in her hand. Each randomly picks a jelly bean to show the other. What is the probability that the colors match? Nov 7: A fair 6-sided die is rolled twice. What is the probability that the first number that comes up is greater than or equal to the second number? Answer: D. 6-6, 6-5, …6-1, 5-5, 5-4, …5-1, … 1-1. So a total of 21 possible pairs out of 36 pairs. Nov 8: Angie, Bridget, Carlos, and Diego are seated at random around a square table, one person to a side. What is the probability that Angie and Carlos are seated opposite each other? Answer: B. Let Angie sit down in any seat. Among the 3 remaining seats, 1 is opposite Angie. Nov 9: If February is a month that contains Friday the , what day of the week is February 1? Nov 10: On February 13 listed the length of daylight as 10 hours and 24 minutes, the sunrise was , and the sunset as . The length of daylight and sunrise were correct, but the sunset was wrong. When did the sun really set? Nov 11: What time was it minutes after midnight on January 1, 2011? Answer: D. Number of minutes per day = 24*60 = 1440. 2011-1440=571, which is 10 hours short of 29 minutes.